Taylor Staughton, our Pro Post Foundations distributor and installer for the Muskoka-Kawartha-Lakes and Parry Sound regions, offers reputable and reliable services. Taylor Staughton is one of the biggest building contractors in the Muskoka-Kawartha-Lakes region. In business since 1989, Taylor is very knowledgeable about the various foundation alternatives offered in the industry, and he has seen his share of difficult and complex construction sites! Taylor therefore decided to add screw pile foundation installation to his already enviable and reputable business portfolio, and chose to do so with Pro Post Foundations! Known for the quality of his services and client satisfaction, Taylor officially joined the Pro Post Foundations team at the beginning of 2018. A former Certified AB Chance pile dealer, Taylor and his team already know a lot about screw pile installation. 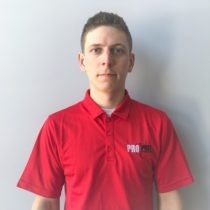 When asked why he decided to join the Pro Post Foundations team, Taylor answered that he wanted to support a Canadian business and its products! As an advocate of the local economy movement and of environmentally friendly alternatives, Taylor felt that Pro Post Foundations was in line with his values. Are you currently trying to decide what type of foundations you will be using for your new construction project? Taylor will tell you that Pro Post Foundations screw piles are probably the ideal solution for you! Our piles can support more weight than any other product on the market and will offer superior stability to your structure. Pro Post Foundations also offer several types of piles to better fit your project’s specific needs! Taylor also mentioned that he is very happy with the fact that Pro Post Foundations is constantly working on improving its products and developing new ones in order to better satisfy its customer!